The Pompeii traditional brown stone lantern outdoor wall light with textured glass is rated IP23, beautiful and features an old fashioned design. The ornate lantern has intricate detailing, with textured glass that shimmers in the light. 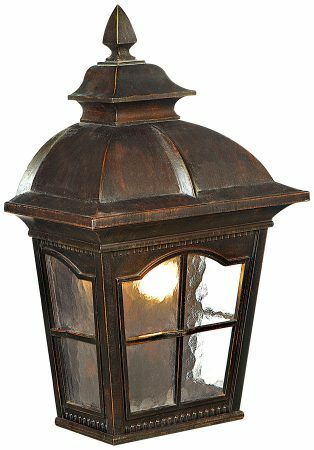 This classic antique reproduction with a brown stone finish fits flush against the wall and is perfect for lighting your garden at night. A 43cm high rustic cast aluminium, brown stone finish windowed lantern, with textured clear glass inset panels. Suitable for almost any outdoor application and capable of taking energy efficient lamps. From the Pompeii outdoor lighting range, supplied with a manufacturers three-year finish guarantee.